Facts about Texas Dawn Water Lily plant. "Scientific name for Texas Dawn Water Lily is Nymphaea". The Texas Dawn is the official water lily of the state of Texas, receiving that designation in 2011 by Governor Rick Perry. The Texas Dawn Water Lily is also an unfamiliar species to many. That is because it was developed by Ken Landon around 1985. The Texas Dawn water lily is a cross between the North Pink Starlet and N. Mexicana No. 1. It reached the broader market in 1990. It is considered a rival to the N. X marliacea Chromatella line, but the Texas Dawn is much hardier a plant. N. Mexicana is a native Texas species, whereas N. Pink Starlet is a popular water garden lily world wide. The Texas Dawn Water Lily is a member of the Nymphaeaceae or water lily family. It is an aquatic plant. 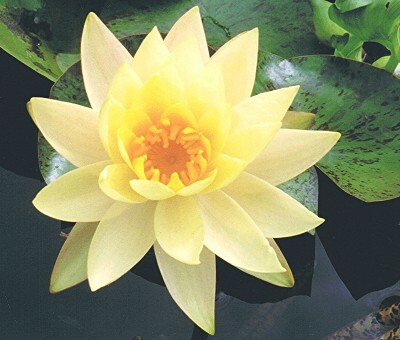 The Texas Dawn Water Lily grows to less than a foot tall above the water’s surface but is up to four feet across. Unlike many water lilies, the stem holds the flower several inches above the water’s surface. The plant has a lemony scent when in bloom. The Texas Dawn Water Lily has yellow inner petals surrounded by larger outer petals that range from light pink to dark pink. The Texas Dawn has dark green leaves with purple spots. It blooms seven or eight times in sequence from spring to mid-summer. It typically blooms again in the fall, with a rich pink color. When the summer starts to cool, you may see a light yellow top of the bloom and a light pink cast to the lower petals. A true Southerner, it cannot tolerate temperatures below 15 F (-9 cel). Texas Dawn Water Lily thrives in USDA zones six through ten. It can survive in USDA zone 5 if protected. Texas Dawn loves full sunlight. However, it can grow in partial shade. The Texas Dawn won the American award in 1990 from the International Water Lily Society. It won the Superstar Water Garden Plants award from the Texas A&M agriculture program as well.